There are four bills sitting on the Governor’s desk. For two we want her to sign them as is, one needs her to line item veto parts of the bill, another needs to be vetoed. In one call, you can raise your voice on all four critical bills. Speaking points provided. Also, a BLM sit in protesting sale of 11,000 acres in Greater Chaco and as a reward. 3 Minute video of AOC telling the truth about climate change. HB546, condemns New Mexico to a future of toxic, radioactive, fracking waste re-use. There are good elements to this bill, but allowing fracked water to be introduced into our agriculture is intolerable, so ask the Governor to veto the bill as we don’t want to start injecting fracking waste in rivers, streams, and crops. In one call, you can advocate on four important bills. Then Sign Up for BLM Sit-In. More info on each bill below with a 3 minute reward at the end of the post. Please Call the Governor to Ask That She Line Item Veto Language Providing Funding that Would Allow the State to Eliminate Local Seed Sovereignty. One of the curiosities of the legislature is that at the end of the session, legislators can slip amendments into bills at the last minute or substitute bills are introduced disguised as something else. And in moments like this, corporate lobbyists are adept at advancing their corporate goals when no one is looking. Well, HB 2 is one example and below is a guest blog from the NM Food and Seed Sovereignty Alliance. During last year’s NM legislative session, we came together in opposition to HB161, a bill which would have preempted local governments from enacting ordinances to regulate the cultivation and production of seeds. That bill was tabled in committee. We have learned that language was inserted back into this year’s HB2 to grant seed regulation solely to the NM Department of Agriculture This would take away our city, county, and local power to create GE (genetically engineered) Free Zones in New Mexico. Please help protect our seeds and our food and seed sovereignty — this is vital to everyone! After reading the post, please call the Governor right now. (505) 476-2200 and offer this input; ”language was inserted into this year’s HB2 to grant seed regulation solely to the NM Department of Agriculture, please line-item veto any language that would limit local and tribal capacity to maintain seed sovereignty.” And Please share this post with others. . Click here for a Retake post that covered this issue in greater detail. When I called the Governor’s office, the person I spoke with was very familiar with this issue and so your views will be counted. HB 546 Allows Fracked Waste or “Produced” Water to be Used for Agriculture. Are you kidding me? From Frack Off Chaco Canyon’s Facebook page. URGENT Action Alert: The NM Senate passed HB546, condemning New Mexico to a future of toxic, radioactive, fracking waste re-use. This is the beginning of the end for New Mexico. Our only hope is that Governor Lujan Grisham won’t sign this terrifying bill that would open the door to using fracking waste in rivers, streams, and crops. Please call the Governor right now. (505) 476-2200. Share.This bill has moved faster than any other piece of legislation this session under the guise of environmental protection. Now that the session is over (12PM Saturday 3/16), we must hold decision makers accountable for caving in to the gas and oil industry in the biggest boondoggle of commodifying TOXIC fracking WASTE to SELL for consumption in the poorest state in the nation. It needs to be vetoed. I am fearful that this bill will be signed, as it is a bill that some Dems and the enviro community are celebrating as a win. There are good parts to the bill, like creating royalties on gas and oil production, but is that worth introducing ‘treated’ fracked water when the science that exists is industry generated. Bad idea. .Click here to read a post from several weeks ago that describes the risks of “produced” water. From the Drug Policy Alliance: Call the Governor. A couple of the most far-reaching drug policy related bills that passed include legislation to end arrest and jail time for possession of small amounts of marijuana and drug paraphernalia and a bill allowing expungement of arrest and public records for certain drug convictions. Thank you for helping us get these bills on the Governor’s desk. We want to make sure she signs these important pieces of legislation before the deadline on April 5. 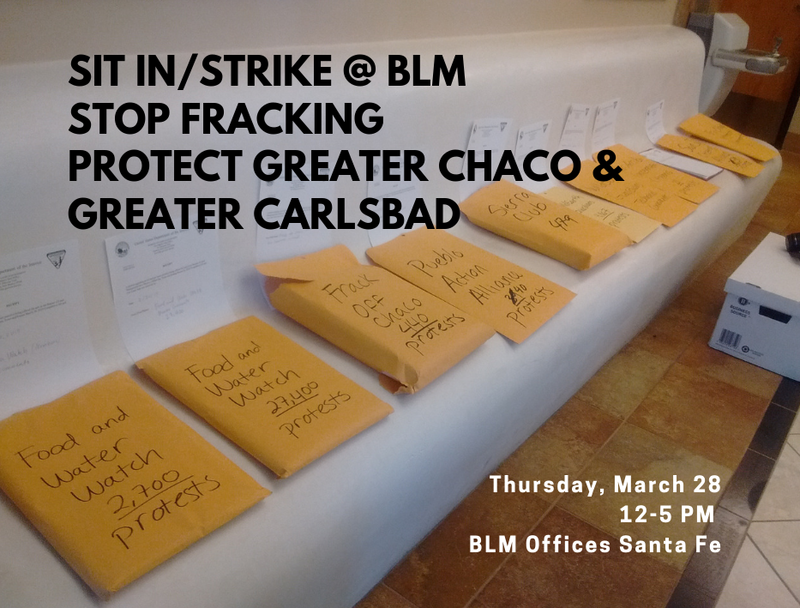 Join us on Thursday, March 28th, from 12pm-5pm for an all-day sit-in at the BLM State headquarters in Santa Fe as we condemn the unacceptable and climate-disrupting activities the BLM is allowing as they move forward with the sale described below. We delivered over 33,000 protests to the Bureau of Land Management (BLM) opposing the March 28th online auction of more public and ancestral tribal lands in New Mexico. Yet, BLM still plans to move forward selling over 11,000 acres of land in Greater Chaco and Greater Carlsbad for industrialized fracking despite overwhelming opposition. By going forward with this lease sale, the BLM is failing in its obligation to fulfill the agency’s multiple-use mandate. Over 93% of lands managed by the BLM in the Greater Chaco region in the San Juan Basin are already leased for oil and gas, and the Greater Carlsbad region in the Permian Basin is part of the nation’s largest oil field and already experiencing the negative impacts of industrialized oil and gas extraction. Inspired by the 1.4 million who marched March 15 for climate justice, we’ll stand strong holding signs on the day of the sale with messages pushing for stronger protections for the community health and safety, clean air and water, climate action, environmental justice, and protecting our cultural resources. Come and voice your concerns and help us amplify our calls for #NoNewLeases and to demand a more just and equitable future. Note: We are requesting shift leaders to support 1 hr sit-in shifts. Please IM Frack Off Greater Chaco to volunteer and coordinate. How can the Governor line item veto language in a bill? I know the Governor can line item veto dollar amounts but I have never heard of language being vetoed. If that were the case, the removal of one or more words from a passed bill could change the entire effect of that bill possibly to the detriment of its intention. Please explain. I may have blown that. I will change it to a veto. My bad. I see from your comment, that this wouldn’t be viable. Unfortunately, then I am sure it will be signed as it is one of the enviro bills that Sierra Club et al are high fiving about.